Kirsan Ilyumzhinov: "They Think That They Have Hurt My Ego. But I Don’t Have It..."
- Good afternoon, Kirsan Nikolaevich. Good afternoon. Where are you calling from? Are you far away? - It depends on where you are. Yes, that's a good question. I just flew from Kabul. Recently I received a delegation from Kabul and met with an Israeli delegation – the secretary of Israel Chess Federation Gil Boruhovsky, who had just left me. - Well, you are a man of the world, that is, no one can be too far away from you. "World" is a proper definition. Right now, I and Gil discussed holding a match between the children of Israel and Palestine. There is already a sponsor. I was in Israel a few weeks ago. I met with leadership of the local chess federation and told them about my programme and my plans. You know that I have been financing the "Chess in schools" programme since 2010. We have already introduced chess as an elective and obligatory subject in many schools. We have agreed on the extension of this programme with Israel Chess Federation and representatives of Israeli Ministry of Education and some municipalities. That's when the idea of holding a match between the children of Israel and Palestine was born. When I came to Moscow, I met with an Israeli billionaire Michael Strauss, who, incidentally, had built a coffee-producing plant "Black Card" in Russia. He is one of the largest coffee suppliers in the world. He owns cafes and restaurants in Israel. And every year he holds music festivals on the border between Israel and Palestine. We agreed that he will sponsor this world chess match. Here he was at my house and we discussed the best time for holding it – either January or February. And at the very moment you called me. Just two days ago, I was in Afghanistan. There, I distributed chess sets among children under the slogan "Chess instead of Kalashnikov". I asked them to give Taliban children a thousand chess sets so that they would play chess instead of fighting and carrying out terrorist attacks. - Kirsan Nikolaevich, I wanted to ask you a question. "Chess instead of Kalashnikov" is a good slogan. However, the war between Russia and Ukraine lasts for almost four years now. Shouldn’t we apply this slogan here rather than so far away? Why Afghanistan? Of course, I understand the reason why, but we also would benefit from chess instead of Kalashnikov here. You know that I was in Ukraine several times. Perhaps, I am the only Russian public figure who visited Kiev, met with presidential administration, was in the parliament – Verkhovna Rada and met with the mayor of Kiev Vitaly Klitschko. We started to implement the "Chess in schools" programme there and I opened a chess pavilion in Taras Shevchenko Park. I visited Lviv several times and met with the mayor. I exchanged souvenirs with Piotr Alekseevich Poroshenko. Besides, I gave him a Kalmyk chess set. You can find its photos on the internet. 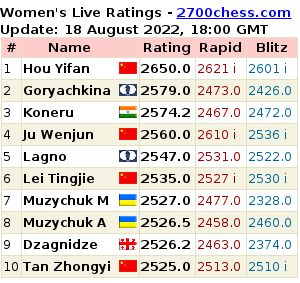 We even held the Women’s World Chess Championship in Lviv the year before last. That is, my slogan "Chess instead of Kalashnikov" is used everywhere. I will soon fly to North Korea to present a proposal of South Korea Chess Federation so that the children may come and play chess in the Olympic Village. That’s how I develop chess. - The best thing you could do was to use that slogan at the opening of a monument to Mikhail Kalashnikov in Moscow. Can you imagine that? By the way, I met with the leadership of Izhevsk chess federation yesterday. They came to me and handed the invitation – they will hold some kind of event in Izhevsk in January or February. So they asked me to organize a chess tournament there. Your question fits the topic – I'll hold a chess tournament at Izhevsk Kalashnikov Plant and bring them chess instead of machine guns. Incidentally, a few days ago, I spoke both on television and at a meeting with journalists in Kabul. When I said that I would give chess instead of Kalashnikovs to the Taliban, I was applauded by everyone. In Kabul, the chess club is located in the heart of the city. Such an idea exists and we will introduce and distribute chess instead of Kalashnikov. On the other hand, I may be criticized that in this case they will be less likely to produce automatic weapons and will lose their jobs. - You will be accused of betraying the motherland and they will say that you are a foreign agent! No, it's not about betrayal of the homeland, it's just business. Some sell sausage, other sell weapons – everyone’s trying to make money. People work there. The more they sell the more profit and bigger salary they get. And then somebody appears with some chess ideas instead of Kalashnikov... However, I'm a Buddhist pacifist so I prefer my slogan. A bad peace is better than a good war. - It's true. But frankly I am amazed by what you have just told me. Because, judging from the latest news about chess and politics, you should not be up to such talks now. You should be focused on other things. How do you manage to do it all? You would not believe it but only last night I held talks with delegation from Sudan until two am. Just a month ago, I was in Sudan and now my team is going there and I will also come before the New Year if I have time. I simply did not expect what actually happened! I met with the local Minister of Education and, as it turned out, she was a chess champion of the school and went to neighbouring provinces with her classmates. So, seeds fell on fertile ground, and a representative of Sudanese Embassy brought a letter of gratitude from Minister of Education today. It turns out that she have introduced and continues to introduce chess as an optional subject in schools. And they are waiting for me to take part in the opening of a chess Academy there. Today, I am negotiating with our Russian coaches to train the beginning chess players there. You know that I have already sent Nikolai Chadaev there. Two months ago, he went to Botswana at my request and my foundation paid him for his trip. He spent a month coaching the Botswana national children team and went to Angola. Now we are going to send him to Cambodia. I run the programme using my foundation and send coaches to places and regions where they have just started to play chess. Today, I spent my day as usual: half of it was dedicated to business and the other half to meetings. I met with delegations from Sudan, Kazakhstan and Israel. Today, athletes from the USA came and they want to meet me. I'll meet with them in an hour and a half. For now, let them settle in the hotel and come to meet me later. - Does your whole life pass in negotiations! Are not you tired of living like this? You see, we live too little. How long does it take before we die? 50, 60, 70 or 100 years? And you should take into account that out of 24 hours we sleep for eight hours, which means that one sleeps for a third of one’s life. Time is spent for meals, travel, etc. Eventually there are 6-7 hours left for work per day. I work for 20 hours daily. When I began to study the Japanese language, I was awake until 2 or 3 am studying the characters and wake up at seven or eight in the morning. That’s how I spend my average day working for twenty hours. When I was President of Kalmykia, I did not even have a single day off. I occupied that post for 18 years and when I resigned my accountant brought me the balance of my salary. I asked him to clarify what it was for. It turned out that it was extra salary for overstaying and working without leave. That is, I have never been on leave for 18 years. And I have never been on sick leave. I'm not a masochist or workaholic. But it's interesting to engage yourself in something. I like to carry out talks, travel, discover something new and visit dozens of countries. I have been to 10 or 12 countries only this November: Sudan, South Korea, Israel, London, Helsinki, Andorra, Mongolia and Tunisia... It is so interesting! New people, new impressions. - Kirsan Nikolaevich, what is happening with election? Frankly, I got confused and I do not understand who wants to be elected and who does not, who frames who and so on. Can you explain how you see it at the moment? For me, the situation is simple. Maybe some are intriguing and some want to make extra money but one thing is clear for me: according to FIDE Charter, elections are held every four years. I was elected in August 11, 2014. 110 countries voted for me and 60 voted for Garry Kimovich Kasparov, the thirteenth world champion. The next elections will be held in late September 2018. Registration for election and nomination of candidates will take place in June. I travel around the world and my main task is propaganda and development of chess. You see, I do not politicize chess anywhere, be it Afghanistan or South Korea. Although I was not recommended to go to Afghanistan because they said that it was dangerous there. And indeed we lived in a hotel, where a bomb exploded nearby killing more than sixty people just a month ago. But I had to go and promote chess because I am authorised to do so as President of FIDE until September. On the other hand, I have the "One billion people playing chess" programme. And I set myself the task of increasing the number of people playing chess in the world to one billion by 2020. There are a few programmes that I have funded myself and with the help of my friends and other investors. For example, there is the "Chess in schools" programme. By the way, 160 thousand dollars, which I transferred to Israel for development of this programme, came from my personal fund. And now this programme is developing in Sudan, Tunisia, in the very America, and in many other countries. Another programme, which I began to actively implement, was invented together with GM Viorel Bologan in Moldova. He came, I helped him technically as well as financially and six or seven years ago we started the "Chess in the villages" programme. We opened chess classes in 600 villages. Later this programme was supported by President of South Africa Zuma. He opened a chess school and Academy in the village where he was born. Garry Kimovich Kasparov was there. And this programme spread to other countries – Zambia, Zimbabwe and Nigeria. There are many countries, where this programme began to be implemented – Vietnam, and Costa Rica. After all, chess is an inexpensive sport. There is no need to build stadiums or ice palaces for billions of euros. In each village there are two or three rooms, which we equip with chess sets and demonstration boards and start developing the game. And there is the third programme, which I have already started to implement. A few weeks ago, I was in London and visited Wales. Together with the local chess federation and local community (the church helped me too) we opened a school for children with autism. I will bring 250 chess sets and chess clocks. And now similar school is being opened in London, Brussels, Belgium and other countries. They supported the idea in South Korea. I established my charitable foundation ‘Kirsan Fund’ in Washington and we start working with children with cerebral palsy and autism. I have such programmes and I want to implement them. There are other options that I want to propose to the delegates of FIDE General Assembly in Batumi in September. If they support my programmes, I will continue to implement them. If they would not support me and vote for another candidate, well, then there is nothing to be done. I still have some money and I will continue to implement those programmes for my own account. - Kirsan Nikolaevich, let's not pretend that the persons, who asked you to resign, did it spontaneously and for no reason. They explain it as follows: since you are under sanctions of the US Treasury it interferes with the financial activities of FIDE. That is their main reason. It does not interfere in any way. Here are the facts. On November 25, 2015 I was included in the sanctions list by the US Treasury. I categorically disagree with this. You know that I am suing them now. By the way, a representative from the US has just arrived and I will talk with him. Well, it's a separate topic. But how does it interfere with FIDE activities? We announced that a match for the title of world champion will be held in New York. According to the sanction law, I cannot manage companies, in which my shares are over 50%. By the way, my foundation works fine there, because my shares in it are less than 50%. But in order to prevent any problems, in December 2015, I called for an extraordinary meeting of the Presidential Council (pay attention to this! ), where I voluntarily transferred most of my powers to Georgios Makropoulos and asked the Council to support me. Nothing has changed since then. We have organized that match in New York. And not only in New York but also in other countries. Thus, there is no way that I harm FIDE. I go and hold meetings everywhere. As for financial documents, I do not sign them. However, I am still involved in other business projects and it does not cause any inconvenience to me. I transferred my powers to my financial and commercial directors when my signatures are needed. I answered more than 200 questions at the US Embassy in London. Moreover, I provided them with all my passports for 16 years and wrote letters to the US Treasury, the FBI and the CIA that if there are any questions, I am ready to buy a ticket, come to Washington and answer them. I even agreed to take a polygraph test. If there was anything else to blame me for apart from newspapers publications about my meetings with Bashar Assad, I would answer all questions: when I met, with whom and why. If you have any secret data against me and I happen to be in the US, do arrest me, put me in jail or on an electric chair. I'm ready! Because I know that I did not do anything reprehensible against the American people and American laws. As early as in 2015 and 2016 some people advised me not to visit the USA. I might be arrested there. If they arrest me then they would have to provide some proof of my wrongdoings. However, I visit any country; meet with ambassadors and leaders of every country except the USA. Recently, I wrote a letter to the State Department and Mr Tillerson with a request to sort this issue out. I asked for a visa again. I even wrote to President Trump that he should interfere if he is really a guarantor of the Constitution and the Bill of Rights. I myself wonder what they can blame me for. Therefore, I do not interfere with activities of FIDE. Our business is normal. Tournaments are held regularly. Thing is, someone decided to use the fact that I am on the sanctions list of some country. But FIDE joins 188 countries and it is necessary that sanctions do not become an instrument of political games. Imagine that tomorrow some country like Mongolia, Trinidad and Tobago, Costa Rica or Cuba would sanction.one of FIDE leaders; let’s assume its vice president. Would it mean that this vice president shall be excluded from chess life? He has no right to occupy his post only if the court proves his guilt and puts him in jail. There is a presumption of innocence. I'm open to dialogue. I am ready to answer any questions wherever possible. Thus, I do not interfere with the activities of FIDE. But for some reason, one or two people decided that I was in their way, and started all this mess. As you can see, I go everywhere; I meet many people in the very Israel, Finland, Britain, Wales and South Korea. But for some reason, some person thinks that this is abnormal. Last year, when I was still under sanctions, this person invited me, Anatoly Karpov and Irina Rodnina to Greece, where we held the Chess Day. I paid for all the activities, participated in a simultaneous chess game with Karpov, met with members of Parliament and organized a dinner for them and the Greek Chess Federation leaders. And everything was normal. More than a year passed after I was included into the sanctions list and there was nothing to prevent me from paying for dinner and inviting deputies. - Kirsan Nikolaevich, you are just like Vladimir Vladimirovich Putin. He never calls the name of Navalny. And you also avoid mentioning any names, especially the name of the person you referred to so many times... Let’s clarify to the audience that it is Georgios Makropoulos. Yes, it is Georgios Makropoulos, who heads the Greek Chess Federation for more than thirty years. At his invitation, I went there and found a sponsor for that event as well as for the children’s chess. It all was considered as normal. At his request – he asked me a dozen times to ask a Duma deputy to come – I called Anatoly Karpov and Irina Rodnina, who heads the Commission on sport and who revived children’s tournaments "White Rook" and "Golden Puck". We all came to Greece. Makropoulos was fine and he didn’t object to a person under sanctions to come and organize a dinner for representatives of the ruling party. There were no problems. - I need to ask you an important question. I do not understand why Andrey Filatov, who has been supporting you for so long time, supports the other side now? I cannot answer this question. It depends on who is that person and what’s he thinking about. Maybe he thought that Makropoulos is somehow better than I am. I've read an interview with Andrey Filatov in the "Sport Express". The reporter asked him about FIDE elections and he said that there will be "four or five candidates" for the post of president, which is unrealistic. I do not know if he knows the rules. Actually, a candidate for FIDE presidency is not alone as such. He must present his ticket, which shall include six persons. And if there are five candidates and each of them provides six people in his ticket, it would mean thirty countries in total. This has never happened. It is almost impossible to gather thirty countries! Under the terms of FIDE, at least five countries put forward a presidential candidate. That’s the problem. Well, it's okay. However, I think it is a bit too thick – not to mention the name of Ilyumzhinov and at the same time say that the most worthy one is Makropoulos... I do not want to comment on that, but if it is his judgment, let it be. I do not want to condemn or judge his point of view. Everybody is entitled to have one. Maybe I did something wrong, I do not know. Although I tried not to say a bad word about anyone all my life. You remember how many interviews you took. I have always tried not to get personal and not stoop to insulting. - Then I have another question about the very same ticket. Do you have anyone in particular on your mind? Can you call someone with whom you are ready to start the race? Perhaps I can. I carry out negotiations very actively now. I travel a lot and meet many leaders. Recently, I was in Slovenia, met with the chess federation leadership and federation president said he was ready to work with me. While I was in Tunisia, I received an offer from Tunisian Chess Federation to include them in my ticket. I have visited South Africa, South Korea and in Andorra. There are proposals and good candidates. Incidentally, I have received an offer from the US and I will discuss that candidate. He was a state employee. Now he is retired but started to work again. He is a chess player. His name is Glen Stark. He had arrived today with American businessmen in Moscow and I'll meet with him in an hour and a half. And if he would not change his mind, I'll include him in my ticket, because I'm ready to work with the USA. In addition, he is one of the investors, a rather well-off person. I once asked him: "Glen, what do you think of me being under the US sanctions?" And he said: "Kirsan, listen, we're working together to set up a foundation. I came here with American businessmen who do not hesitate to meet with you and work. "In London and Zurich I met with investors and businessmen from the United States. We discussed some projects. Particularly, they are considering investing in Russia. They are ready to invest in agriculture, food and the pharmaceutical industry. A few days ago, we talking on the phone – Glen was in Washington, DC at the time – and he said that he had consulted with friends and teammates and is ready to officially announce that he, a US citizen, is included into Kirsan Ilyumzhinov’s ticket. He is ready to cooperate. Well there are other candidates. For example, Willie Iclicki. This is a man who was the chief treasurer of FIDE for six years from 1990 to 1996. He worked with Florencio Campomanes, lived in Belgium and now settled in Tel Aviv, Israel. By the way, he is the author and publisher of the first chess encyclopaedia "FIDE Golden Book". He was one of the leaders of Association of Small States of Europe. About seven or eight years ago, he asked me and I contributed 50 thousand dollars from a charity foundation that was not connected with FIDE. He said: "Kirsan, there are ten small states in Europe and it is desirable to organise tournaments among them". That’s how we created the Association of Small States of Europe. At his suggestion, we started to hold tournaments every year. He is ready to be included into my ticket as a citizen of Israel and Belgium. According to the rules, there must be one woman in the ticket. Now there are several outstanding and beautiful candidates. They all are well-known women. One is a very famous chess player and she is ready to work. - Will you choose the best or most beautiful one? Both! 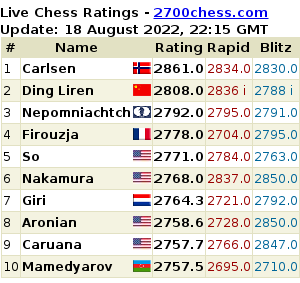 They all are very nice and do a lot for development and promotion of chess. One of them has already submitted her programme to me. One of the world champions is also considering such possibility. But my team will be a new one. All the ticket members will be new. Oh no, not all new! One of them is a member of the old team. He also offers his input and his own programme. - Do you completely rule out a return to your team some of those who have been with you before, but switched to the other side later? There is no other side for me. I understand what you are asking. You know that I never intrigue. You are welcome to vote if you want it. I say openly that if you want to work, then I'm ready too. Provide your programme and your plan. Stop trying to hurt me by not letting me to attend some events like the opening ceremony of the World Cup, my brainchild. You should remember how I "gave birth" to it: Groningen, Lausanne... I and Alexander Roshal invented it in Singapore. I introduced the knockout system, which turned into the World Cup later. I asked them if they had any concrete plan. They think: let’s stop Kirsan from attending the Championship and hurt his ego. But I don’t have it, I just serve chess. That's my hobby and my life. I try to react normally. And for them it is some kind of intrigue that involves some money. I was never a member of any of the Appeals Committee in 22 years, haven’t you notice it? And they pay money there! I have never received institutional money. Even in Baku at the World Chess Olympiad, I, as FIDE President, was entitled to get travel expenses – about five thousand dollars, as far as I remember. I have not received them. - And what’s happened to this money? - I just put it that way. The essence of the matter will not change by the expressions you use. Yes, I understand. Let them work if they are ready. Let them put forward proposals without intriguing. You rightly pointed out a few minutes ago – they repeat it, like a mantra: "Kirsan is under the sanction of the US Treasury and so he cannot be the President of FIDE". Why cannot he? I do not understand. I still do not agree with it and they cannot convince me and many other countries, which I visit, that I interfere with FIDE activities. Now they come to Andorra to take part in a meeting of the Association of Small States of Europe. Instead of talking about chess they criticized me for an hour because I would not resign voluntarily and, being under sanctions, interfere with federation activities. However, they could not answer the question of one of the chess federation leaders – how actually does Ilyumzhinov interfere? If they convince me and make me understand how I really interfere with FIDE activities then, of course, I'll resign. All they talk about is they will offer this post to someone else or sell it... I told the very Makropoulos, I understand that you want me to resign. However, what is your programme? What is your team? And his answer was: you go first and we'll think about it later. I do not see the logic of this. Do you see? - No, That’s why I’m asking you. I do not see the logic of this. It does not bother me much; and does not hinder me in my work. The only thing that bothers me is inability to come to the US, where we are going to develop a certain programme. I hope Tillerson will give me a visa in the near future and I will go there. - Let’s talk about the logic and Makropoulos, since we are on that subject. What's the story about the document, which Silvio Danailov put on Twitter? According to it, you allegedly signed a decree on allocation of certain funds for medical treatment of Makropoulos in 2014. The amount was a hundred of thousands of euros or dollars. That’s not clear. As I understand it, 118 604 euros were spent on medical treatment of Makropoulos. I never signed any documents related to one hundred eighteen thousand euros and I do not remember that this issue was ever raised. After all, what is FIDE money? Apart from my sponsorship money it includes membership fees, competitions revenue and so on. Therefore, this issue should be considered not only by Presidential Council but FIDE General Assembly as well. There, delegates approve the budget for a year or two years, and then spend the budget money. So, this issue was never discussed by Presidential Council or FIDE Executive Committee or the General Assembly,. - Did you sign it? No, I did not sign it. - But there is your signature. - Did it happen within the same period? No, he was sick in 2015 or 2016. I need to check. As FIDE head, I did not give order to spend one hundred eighteen thousand euros for a medical treatment. This issue has to be investigated! Otherwise, any member of FIDE or any member of the Presidential Council may ask a hundred thousand or fifty thousand euros for a treatment. Isn’t it so? After all, Ilyumzhinov cannot control the FIDE budget money. The delegates of General Assembly control it. What if someone said: "Why should we give one hundred eighteen thousand euros to the medical treatment of Makropoulos when some other chess player is much sicker?" Or: "I'm too sick; I need to get tested, please, give me thirty thousand". Is it logical? Why money was transferred somewhere without a reason? - You said that it’s worth investigating. And who is going to do it? I am afraid no one will. Well, there's FIDE Ethics Commission. I know that Nigel Short appealed it once. They are now trying, putting it mildly, to prove something... For example, I'm President of FIDE and control all finances. Short wrote an open letter long ago. Some chess players and even entire federations sent letters to Commission. However, so far there was no response. If they answer and clarify what exactly has been discussed and what decision has been made then everything will be clear. However, if nothing was discussed, then I have no clue what it was. I tell it one more time. I do not judge. I have no right to make any verdicts or decisions. Let competent authorities handle this and all questions will be answered. - Good. Kirsan Nikolaevich, would you please comment on recent information about you running for President of RCF instead of FIDE? I do not know yet. One of the journalists asked me and I said that I have not yet thought about it. I know that election will be on February 3, but I am not sure yet. Besides, nobody nominated me. A regional chess federation should nominate a candidate. Today, governors called me and asked if I would run for President. I told them to wait. I have to visit some countries to promote the world chess. - Yes, the Palestinian issue is being solved. Last year, I visited about twelve regions. I signed agreements on development of children's chess with Belgorod Region Governor Savchenko, Kaluga Region Governor Artamonov, Governor of the Lipetsk region from Korolev, President of Yakutia Borisov, Kemerovo Region Governor Tuleyev and so on. I visit many regions. Recently, I opened a chess class and kindergarten with chess lessons. - Kirsan Nikolaevich, can you tell me a secret: will you use Russian resources in this electoral period? What do you mean? What is Russian resource? - Well, there are embassies... I mean a political resource. Since 1991 I was a member of Supreme Soviet of the USSR, deputy chairman of the Committee on Foreign Affairs and External Economic Relations both in Supreme Soviet of the RSFSR and the Supreme Soviet of the USSR. I was President of Kalmykia. By the way, I have also graduated from MGIMO. Half of my fellow students, including those with whom I lived in the same dorm, are ambassadors and consuls general now. Whenever I come to any country I meet someone I played tennis with or lived in the same room. Where I have been recently? In Tunisia and Libya. Our ambassador in Libya is Ivan Molotkov. He was my classmate. - That is, in one way or another, but you still use your connections? Well, of course. I'm not idle. I actively cooperated with all government agencies and not only in Russia, but also in our neighbouring countries. Generally speaking, I get some support in those countries, where my friends and classmates are prime ministers or heads of state. For instance, I came to one of the Eastern European countries and Prime Minister said to me: "Listen, Kirsan, an ambassador of a country member of the European Parliament was here. He asked me to vote for your opponent. I told him that when he just started to play chess, I and Kirsan were already playing table tennis in a dorm…"
Once, the ambassador of the United States of America came to the sports minister of one of the Arab countries and asked to support some candidate for the post of FIDE President. The minister was surprised: "Has Kirsan already left? Why did not he write me?" They told him that he had not leave but they did not want him to be re-elected. And the minister said: "Listen, I was at his house and ate at the same table with his mother and father. How can I speak against him?" I did not ask him to support me. He just called me later and asked: "Why did not you tell me about elections?" I said I was too busy doing other things. He said: "While you were too busy an ambassador came and asked me to support your opponent." - Kirsan Nikolaevich, I need to ask you probably the last serious question. You repeatedly stress that you never make it personal in any conflict and try not to fight or insult anyone. This is so. At least this has never happened during our interviews. And, of course, you are known for your grandmaster's mastery of the technique of diplomacy. However, several times I saw you on Russian federal TV channels, where you acted in a different manner. Even when you do not talk directly about someone, let's say about the very Kasparov, still you just play along with the propagandists who are leading the show. Obviously, it goes against your style and damages your reputation. Why do you do it? Why don’t you stop playing along with federal channels? I hope you you know what I mean. I have no idea if I played along there or didn’t. I am always natural. The problem is that there are no live broadcasts. In general, there are few live shows and it’s not only in Russia. I've just returned from Kabul, there is also the case. Those programmes, in which I participated, for example, talk shows, are recorded in the afternoon and broadcasted later. For example, last week I participated in recording a programme on Channel One, where I was put on a lie detector. I remember, there was a programme about Mikhail Sergeyevich Gorbachev or perestroika. I was the only one on Mikhail Sergeyevich side. Everyone for some reason shouted and yelled at him. You should remember that I spoke normally. - Of course, I do remember. And then I saw the broadcast. So much was cut and mounted! For example, you speak for five or ten minutes, but they show you for one or two minutes. I always say what I think, but they show what they want to show. But I never take back my words. Ah, there was an interesting case with Pozner! Vladimir Vladimirovich Pozner once invited me to take part in his programme on the first channel. I was warned that it was a live broadcast. I could not care less. Then Vladimir Vladimirovich said: "Good evening, dear viewers. Today, our guest is President of Kyrgyzstan, Kirsan Ilyumzhinov, who came to us..." I replied: "Vladimir Vladimirovich, excuse me, but I am not President of Kyrgyzstan yet but President of Kalmykia". And he exclaimed: "Hold on! Let’s start all over". I was in shock: "How come?! A few minutes ago I was told that it was live!" Have I answered your question? Well, they did not actually deceive but that's what happened. I have nothing against Posner, but they should have told me that that was not live broadcast. - Thank you, Kirsan Nikolaevich. We probably will not meet again this year, unless something urgent happens, because the New Year is approaching. In the eve of New Year, would you like to wish something to all fans of chess, our listeners and readers? In general, I would like to congratulate everyone with the New Year. On December 12, a few days ago, according to Kalmyk lunar calendar, we have already greeted the Kalmyk New Year – Zul. This is the year of the Dog. A dog is a very nice pet. Thus, the next year will be a very good one. And I would like to wish everyone comforts of home and happiness. So that the Year of the Dog always keeps you warm with rays of good and well-being. As they say in Kalmykia: "I wish you the White road!" So that you have a white smooth road and meet only good people on your way. - Thank you very much! It was Kirsan Ilyumzhinov. And please accept our congratulation with the last holiday. Silvio Danailov: "The Future of Chess Lies in the Internet"
M.BOYARD: This is Chess-News and we have two honor guests today- Mr. Silvio Danailov, the President of ECU and Artur Czyz, the tournament director of the XIV EICC. Welcome and thank you very much for accepting our invitation. So, the first question goes to Mr. Silvio Danailov and it’s about the ECU Board, which took place during the last days. Could you tell us a bit about the new decisions you’ve voted for? Georgios Makropoulos: "Ilyumzhinov Is the Biggest Guarantee at This Moment In FIDE"
E.SUROV: We are in Rhodes, Greece. This is Evgeny Surov. Zurab Azmaiparashvili is also here with us and he will be translating this conversation. First of all I am happy that we eventually managed to talk because I think the time for it has already come. Andrew Paulson: "Why People Spend Money on Chess?" E.SUROV: Andrew, I’ll start with the only question I was asked to present you after it has been known about the possibility of this meeting. How much money would be enough to propose you in order to leave chess immediately? Silvio Danailov: "I Will Be Fighting..."
E.SUROV: Silvio Danailov, the President of the European Chess Union, is with us. Good evening! Silvio Danailov: "Reaching New Frontiers"
E.SUROV: This is Chess-News. My name is Evgeny Surov and honestly a long-waited guest, president of the European Chess Union, Silvio Danailov is now on the line. Greetings, Silvio! The Serbian Chess Federation feels compelled to address the public, the media and national chess federations this way due to unjust and illegal treatment by the World Chess Federation (FIDE) lasting for a year already. Ilya Levitov on FIDE: "There's Not Such an Organisation. Their Actions Are Supported Neither By the Idea, Nor By Any Plan"
Zurab Azmaiparashvili: "You Can't Exclude Kasparov, You Can't Exclude Kirsan, And There Is One More..."
Duration: 1 h 08 min (in Russian).